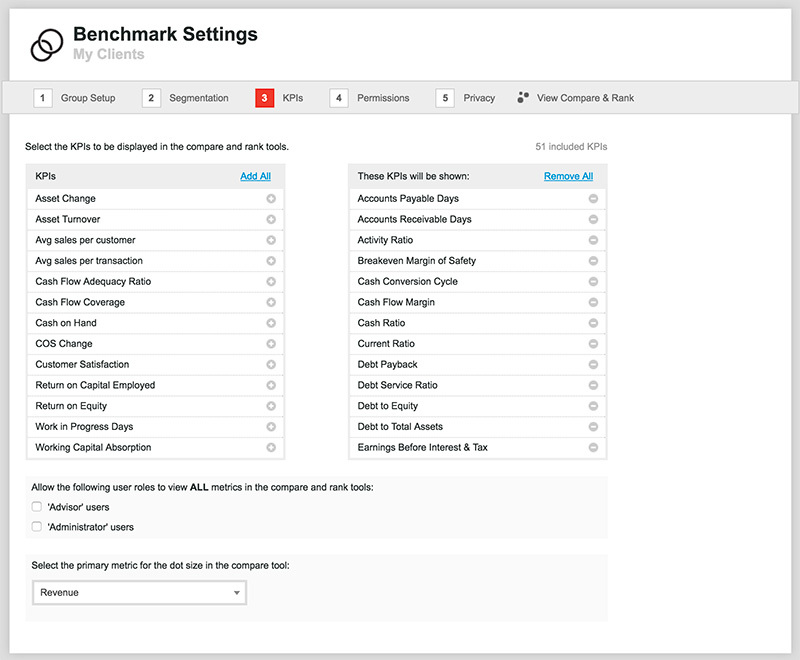 Next, you can specify which KPIs you wish to include in this benchmark analysis. For example, you may wish to exclude financial KPIs and limit the analysis to only non-financial KPIs. Or perhaps you wish to limit the KPIs reported in the benchmarking to a small set of the KPIs which each company tracks. Simply click the '+' icon next to each KPI to include it. From this step, you can also choose which KPI should represent the dot size in the compare tool. The dot size allows for a core benchmark metric even when comparing across all other metrics. When you have finished selecting KPIs for benchmarking, please proceed to ‘Step 4’ of the benchmark group setup.